This diagram depicts the relative positions of Mars, Earth and the sun during a period that occurs approximately every 26 months, when Mars passes almost directly behind the sun from the perspective of Earth. An alignment of Mars, Earth and the sun will force NASA's fleet of Red Planet spacecraft to fend for themselves for two weeks beginning on Sunday (June 7). 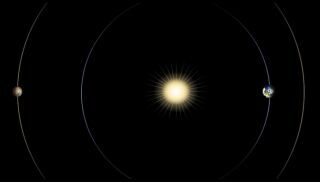 From June 7 through June 21, Mars will be behind the sun from Earth's perspective. This celestial geometry, known as a Mars solar conjunction, makes radio communications between the two planets difficult — and potentially dangerous, as choppy or garbled instructions could actually harm spacecraft or hamper their missions, NASA officials said. But that doesn't mean Opportunity, Curiosity, Mars Odyssey, the Mars Reconnaissance Orbiter (MRO) and the Maven spacecraft will get a two-week vacation. "Spacecraft will continue making some science observations during the conjunction period, though rovers will not do any driving or arm movements," NASA officials wrote in a statement Wednesday (June 3). The Curiosity rover touched down in August 2012 and is therefore a conjunction veteran as well. "Our overall approach is based on what we did for the solar conjunction two years ago, which worked well," Nagin Cox of NASA's Jet Propulsion Laboratory in Pasadena, California, who is leading conjunction planning for Curiosity, said in the same statement. "It is really helpful to have been through this before." Curiosity and Opportunity will send some data up to the orbiters during the conjunction period, NASA officials said. MRO and Mars Odyssey will continue to relay information to Earth from June 7 through June 21, but they will also store the data on board for re-transmission after conjunction. Maven (whose name is short for Mars Atmosphere and Volatile Evolution) won't transmit any information back home until conjunction is over. Curiosity will store its own information on board as well. But Opportunity, which has been experiencing memory problems lately, will rely on the orbiters to safeguard the science data it gathers during conjunction.